The other thing that this brings to mind is a particularly unpleasant experience we had with a dog trainer. They were of the old-school, and in a dangerous attempt to instil respect and greater attentiveness to my recall command, the trainer threw a metal chain at Theo’s hind-legs. The sound and shock were supposed to trigger some sort of aversion in the dogs to make them more obedient. As you can see, Theo is not bothered by noise. 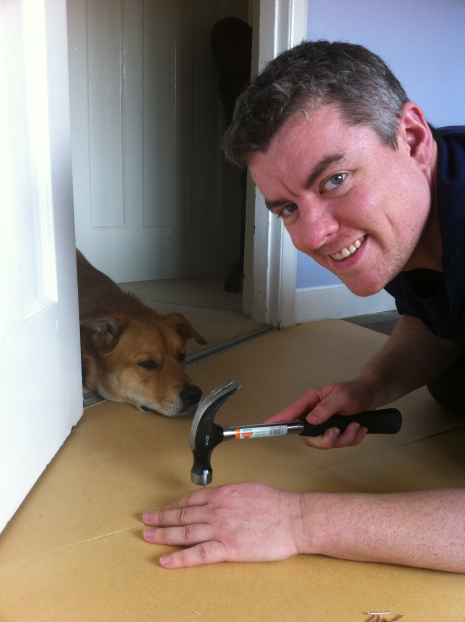 When I hammered in the nails into the floorboards, the noise and vibration were loud, and he didn’t bother much.